The city of Kollam ( Quilon,'Ku-lin' in Chinese history) witnessed history being made on its shore recently. Now a minor cargo port, efforts were being made to deepen the waters to allow ships with larger draught to berth in the Kollam port. The suction dredger was bringing up muck from the bottom of the channel and depositing it on shore, to be removed to some landfill. Then, suddenly, someone noticed in January 2014 that the muddy slurry contained priceless artefacts including Chinese potsherds and coins. There was a virtual 'gold rush' on the Kollam coast for several days, until the district administration intervened and brought some order. The suction dredger did not disappoint; it continued to disgorge hoards of Chinese coins. 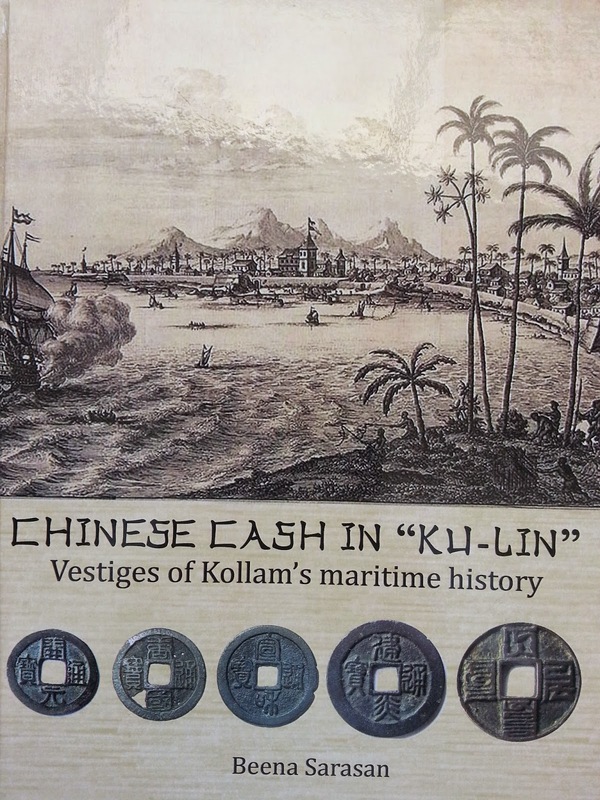 Mrs. Beena Sarasan, an authority on South Indian numismatics has studied the Chinese coins unearthed in Kollam and has produced an attractive monograph, entitled 'Chinese Cash in "Ku-lin" - Vestiges of Kollam's maritime history'. 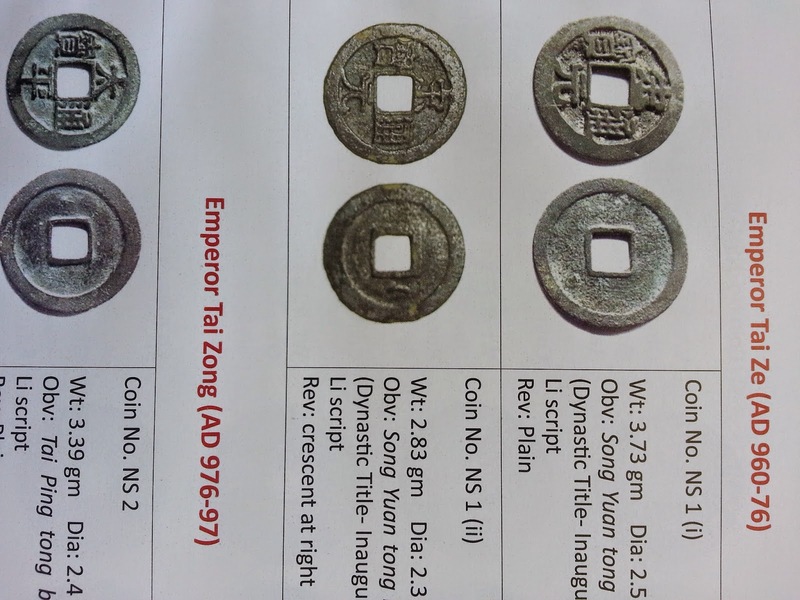 She has studied the particular features of each type of coin which extends from Tang dynasty (618-907 AD) through Southern Tang kingdom, Northern Song dynasty, Southern Song synasty, Jin dynasty and Yuan dynasty. She has also described in detail the significance of the indigenous Chola coins (kasu) found along with the Chinese hoard and analysed the details of the Chinese coins discovered a year before from the nearby Sasthamcotta Lake, consisting again a mix of Tang and north and south Song era. Viewed from the broader canvas of relations between India and China, we notice a break in the 11th Century, according to Buddhist traditions. It seems the last Indian monk ( named Che-ki-siang) went to China in 1053. The last Chinese monk to have arrived in Bodhgaya was recorded to be in 1033. However, relations between China and south India followed a different trajectory. Commercial relations which started during the Tang period continued uninterrupted throughout the Song period. We find evidence of this in one of the largest hoards of Chinese coins discovered in Thalikettai village of Mannargudi taluk, Tanjavur district in Tamil Nadu, in 1944. It brought to light 1818 coins which represented an unbroken series of coins from Sui period (585 AD) to the end of Song period (1275 AD). Much of the evidence relating to Chinese trade in the west coast of India is obtained from Chinese sources, like Mahuan's account and the transcription of Ming stelae. Researchers like Prof. Karashima have unearthed some evidence from extensive collection of potsherds gathered from the sandy coast. The importance of the present Kollam finding should be considered in the light of this. It is for the first time that a hoard similar to the 1944 Thalikettai hoard of the eastern coast has now been found in the western coast which was dominated by the Ku-lin port. Chinese records of the 12th Century, like Zhou Qufei's Lingwai daida ( 'Information on What is Beyond the Passes') described how Chinese sea-faring traders who were planning to go to Dashi ( the Persian Gulf) had to change to smaller boats in Kollam. Another interesting fact relates to the determination of Kublai Khan, the founder of the Yuan dynasty to conquer and subdue Ku-lin. His attempts present a contrast to the subsequent voyages of Zheng He under the Mings. Yang Tingbi, as the emissary of Kublai Khan visited Kollam in 1280 and sought its submission. Having failed in the mission, Kublai again sent Yang Tingbi to Kollam, this time accompanied by Hasaerhaiya (Qasar Qaya) who had been given the grandiose title of 'Commissioner of the Pacification Office (in charge of) Kollam'. Bad weather forced this second expedition to land in Kayalpattanam. The Chinese enquired there about the land route to Kollam, but the local officials refused to reveal it to the Yuan entourage. The disappointed emissaries returned to China, yet again. Kublai Khan refused to give up. Yang Tingbi was himself appointed the Commissioner of the Pacification Office and sent on a third mission to Kollam which reached in 1285. ( The monograph gives a slightly different version, quoting from Yuan shish). 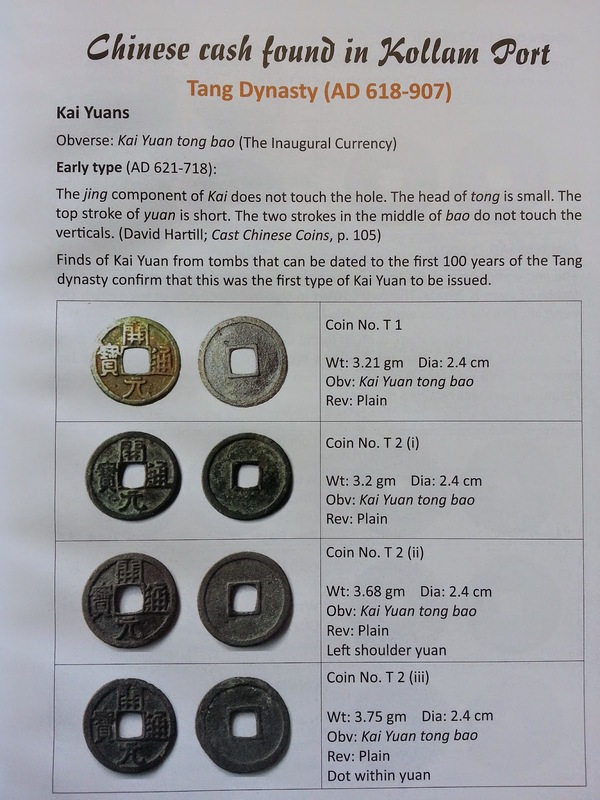 The author of this monograph has described the features of each of the coins, beginning with the Kai Yuans which belonged to the inaugural series of Tang dynasty (618-907). The crescent shaped mark on the reverse of the Kai Yuan coins is attributed to the finger nail mark of Empress Wende who had inadvertently stuck one of her nails into the wax model of the coin which was first presented to her. As a mark of reverence, the crescent mark was reproduced in all the Kai Yuan coins! Of all the dynasties, the Kollam collection has the least number of coins belonging to the Yuan period, represented only by one large 10 cash coin in Mongol script. This may look anomalous, as we saw above that there was hectic activity during Kublai Khan's regime. But, as explained by the author, paper money printed on cotton or mulberry bark was made popular during this period and this probably accounted for the scarcity of Yuan coins. We are sure that the recent revival of interest in studies about Malabar- China relations among Indian and Chinese scholars will find the present volume of great interest in reconstructing the glorious era of cooperation for mutual interest which marked the maritime trade during the early medieval period. 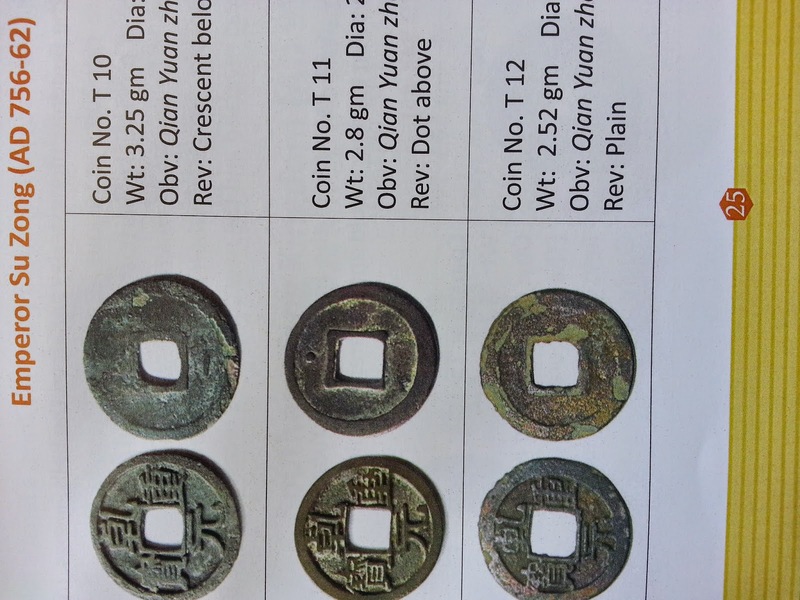 In the end, we would request the author to catalogue and study the collection of 15 Chinese coins (tentatively identified as belonging to the later Manchu Qing dynasty 1711-1850) which are with the manuscript library of Calicut University. 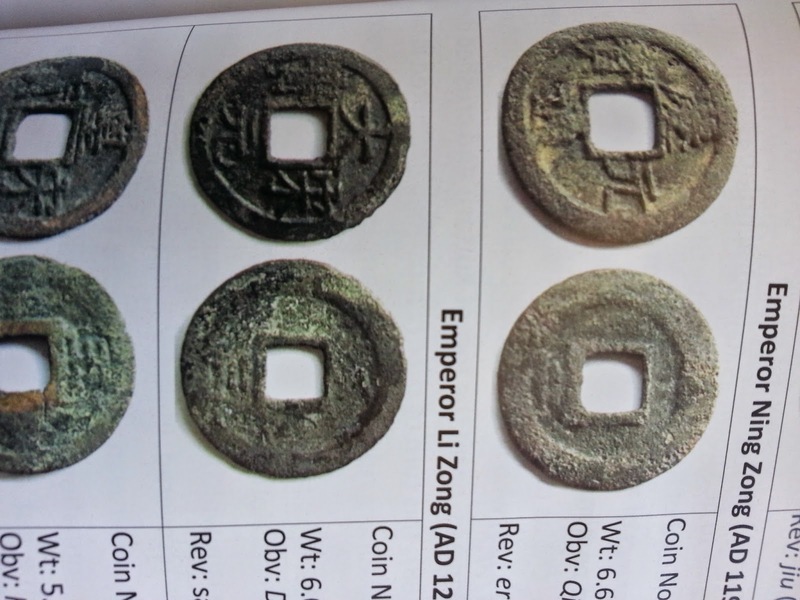 These coins were discovered in 2007 by Dr. Liu Yinghua, a Chinese scholar of Sanskrit and Ayurveda who was then studying under Prof. C Rajendran of the Sanskrit Department of Calicut University. 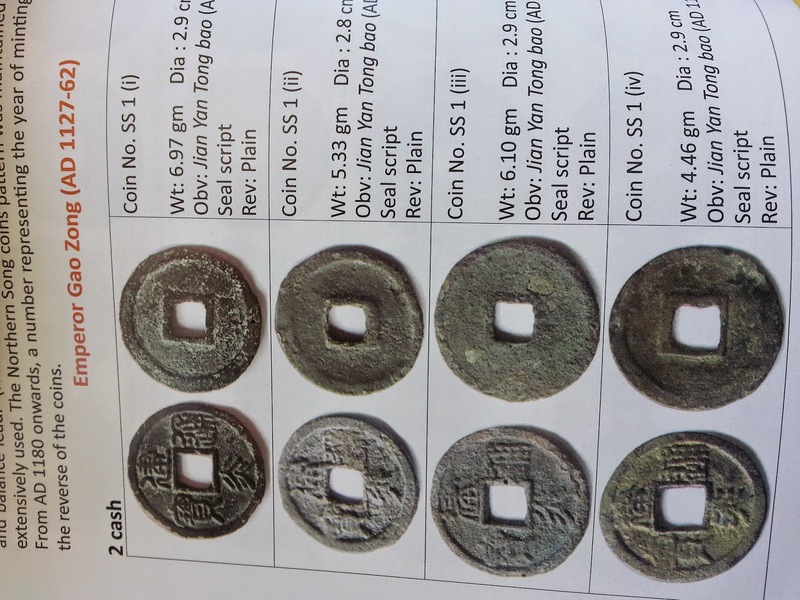 Dr. Liu noticed that the metal pieces used to tie the manuscripts were in fact Chinese coins. How these coins came to British Malabar and to the Namboodiri illam from where most of the palm leaf manuscripts were procured, should make a fascinating study. Certainly interesting. I am looking forward to reading the book. This will provide more details of the existence of trade between Quilon and China during the Song period.. It's very interesting for me, I have long been collecting Chinese coins. It is the pride of my collection. It all started long ago, after I read this article http://coinschecker.com/ . After that, my life has changed for the better.